Smart meeting planners know that their attendees need the latest technology to get their jobs done efficiently or just to make their stay in Chicago that much easier. That means finding hotels and venues that have technologically advanced systems right at guests’ fingertips. Here’s a roundup of 10 spots in Chicago that use everything from wizard-like guest room tablets to cutting-edge conference technology to make corporate life a breeze. 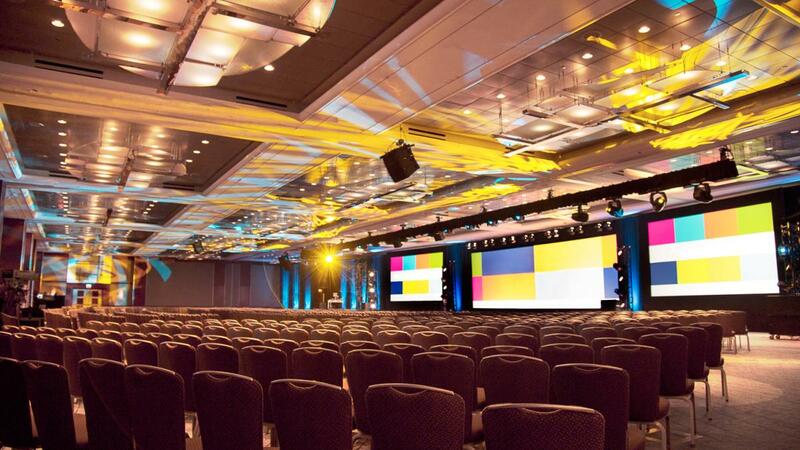 The city’s new Conrad Chicago made tech a serious priority when planning its meeting and event spaces. It was the first Hilton Worldwide hotel to utilize 3D custom imaging in partnership with Social Tables, an award-winning collaborative event planning software company. 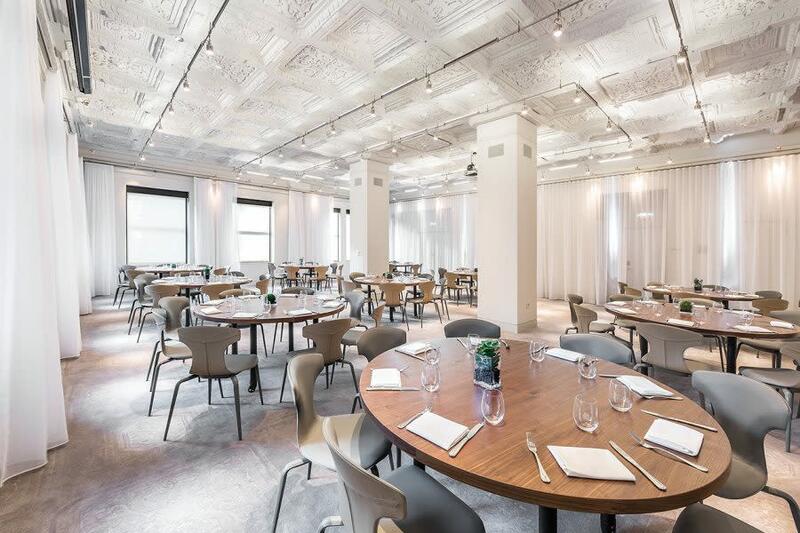 The technology allows planners to view a 3D rendering of a Conrad Chicago meeting or event space, complete with decor, table arrangements and a peek at the room’s sweeping city views. 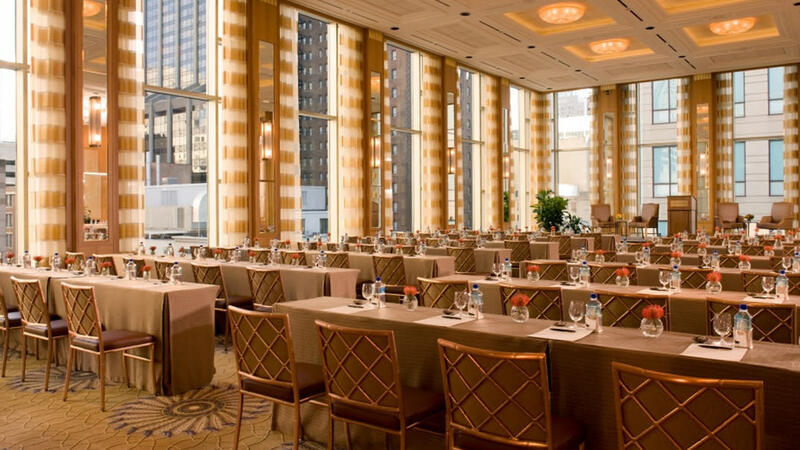 Located on the hotel’s top two floors and encompassing 10,000 square feet, all of Conrad Chicago’s meeting facilities are equipped with state-of-the-art video conferencing and messaging systems via 78-inch flat screens. 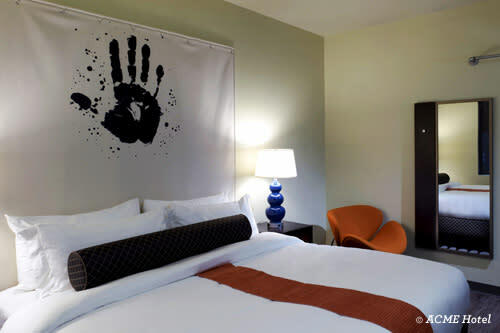 This innovative hotel brilliantly snuck high tech into seemingly ordinary guest room features. For example, the headboard is equipped with lower lumbar support so you can comfortably lean against it while working on your laptop. A Bluetooth soundbar has replaced outdated iPod docks to play audio from any Bluetooth-enabled device. The TV goes beyond entertainment, capable of ordering room service and controlling the room temperature. The clock projects the time on the ceiling at night, and the Do Not Disturb door hanger has been replaced by a service light on the door. Such playful innovations continue into Virgin’s cool meeting and event spaces, ranging from the industrial-feel Manor for large groups to the intimate Founder’s Room. Located in River North, this hip hotel is outfitted with the technology millennials demand. For starters, the free Wi-Fi is a speedy 100MB Bandwith. All rooms are outfitted with smart TVs along with Alexa, your own Amazon assistant. Suites are wired with Bowers and Wilkins Zeppelin wireless audio systems, and some are even equipped with ESP guitars for rocking out in the privacy of your own room. Plus, Apple watches are available to check out from the front desk for free. Book an event for up to 140 guests in The Berkshire Room, known for its craft cocktails, microbrews and small batch wines. Charcuterie, cheese and desserts can also be included in a private party package. Besides a glamorous recent hotel renovation, The Peninsula Chicago has also upgraded its in-room guest experiences. Guests can now control their room lighting, temperature, music, HDTV programming and even room service via a tablet that also contains city information. The new Mobile Concierge service sends text messages directly to guest cell phones. And VOIP-enabled guest room phones allow for free international phone calls via the internet. The Peninsula Chicago’s 11 unique meeting spaces (several of which boast dazzling views of The Magnificent Mile) feature state-of-the-art audio and visual equipment, with on-site PSAV Presentation Services at the ready to provide technical support. 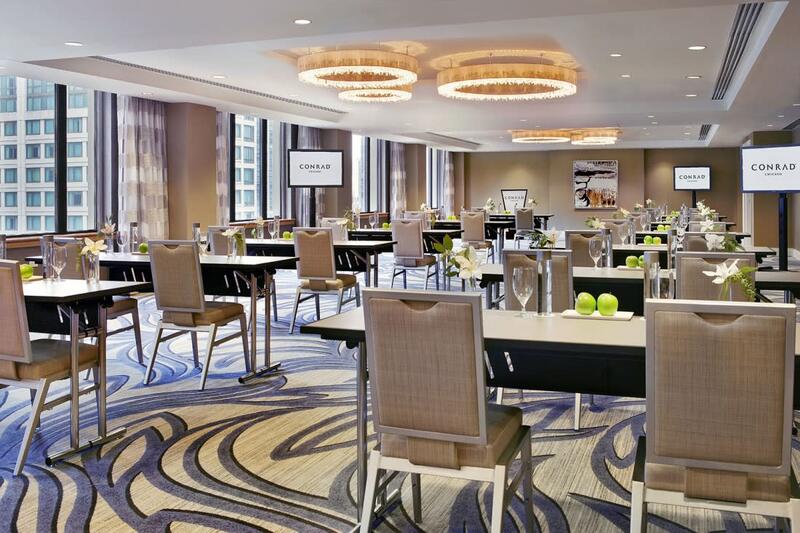 In June 2016, the Hyatt Regency Chicago added 22 new meeting rooms (accommodating groups of 8-250), bringing its total meeting space to a staggering 240,000 square feet. Interactive plasma displays with rotating digital convention info make navigating the huge hotel (which is Chicago’s largest) easy, along with Google Maps touchscreens that allow guests to precisely locate meeting spaces. The Meeting on Demand tech tool lets planners check meeting room availability and pricing in real time; reserve guest rooms; and submit food, beverage and audiovisual requirements, all online. 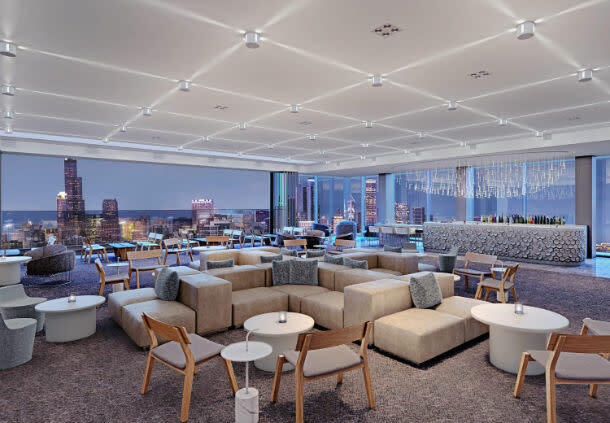 This lively Loop hotel features more than 7,000 square feet of meeting space, with smart rooms boasting floor-to-ceiling windows with awesome downtown views and the latest conference technology (with an in-house audiovisual team for support). 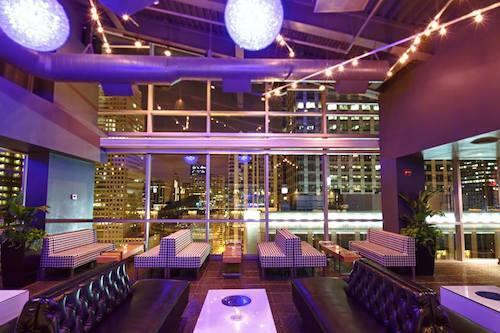 Plan an event at the modern ROOF on theWit, a year-round rooftop lounge on the hotel’s 27th floor that features a retractable roof. The entire ROOF can accommodate 300 reception-style, and uses a projector as part of a 3D mapping installation to create a dazzling light show on a 20-by-12-foot video wall. TheWit also features SCREEN, a private high-definition, multimedia theater. SCREEN offers sophisticated projection and audio technology, including Skype and teleconferencing capabilities, across a 24-foot-wide screen. There is seating for 50 on plush recliners and sofas. The newly opened Marriott Marquis Chicago towers 40 stories above the South Loop and McCormick Place, where it’s inter-connected to the convention center as part of The Collection at McCormick Square. With more than 93,000 square feet of meeting space, the Marriott Marquis offers an infinite combination of flexible event spaces. Fiber-optic technology throughout the hotel ensures that all 63 event rooms and 48 break rooms, plus two ballrooms (both featuring 25,000 square feet of convention space), feature the fastest form of broadband technology. 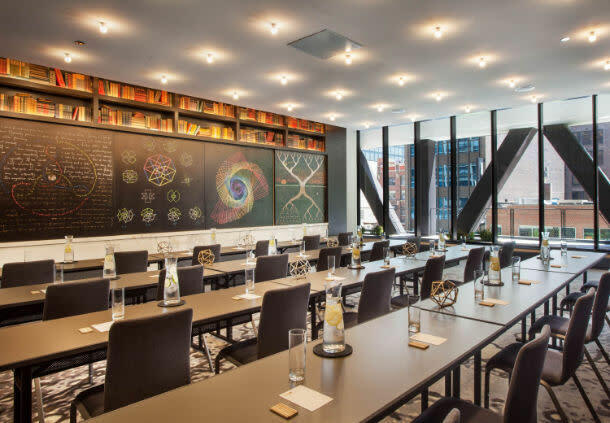 This Streeterville hotel is committed to its art-and-science theme, from the name EMC2 to the antique microscopes and books used as design accents, right down to the Albert restaurant (named for Albert Einstein). In its guest rooms, the translucent showers are inspired by laboratories of the 1920s and are unique room centerpieces. Two robots (named Leo and Cleo) glide up and down the hotel hallways delivering extra linens or bottles of water requested by guests. The TV remote controls the lighting and thermostat, and each room has an Amazon Echo unit that streams music and answers questions via voice command. Host a meeting or event for up to 100 in one of Hotel EMC2’s two meeting rooms (equipped with high-speed internet and A/V equipment) or on the outdoor terrace. 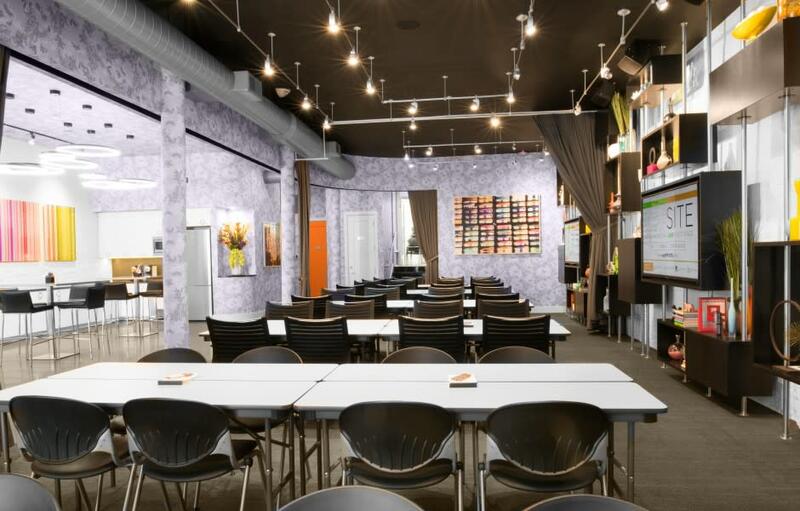 Located in the hot West Loop area, OFFSITE Chicago can host meetings and events for groups of 10-80 in a cool, creative environment. You’ll find the latest technology, including huge LED 3D TVs for video displays on the main floor and in the mezzanine, iMac desktops with wireless clickers, pre-wired live camera feeds, wireless microphones for presentations, a modular conference table with built-in A/V integration and private high-speed internet. The complete main floor and mezzanine (outfitted as a conference room) is at your disposal, as the entire venue is devoted solely to your event. 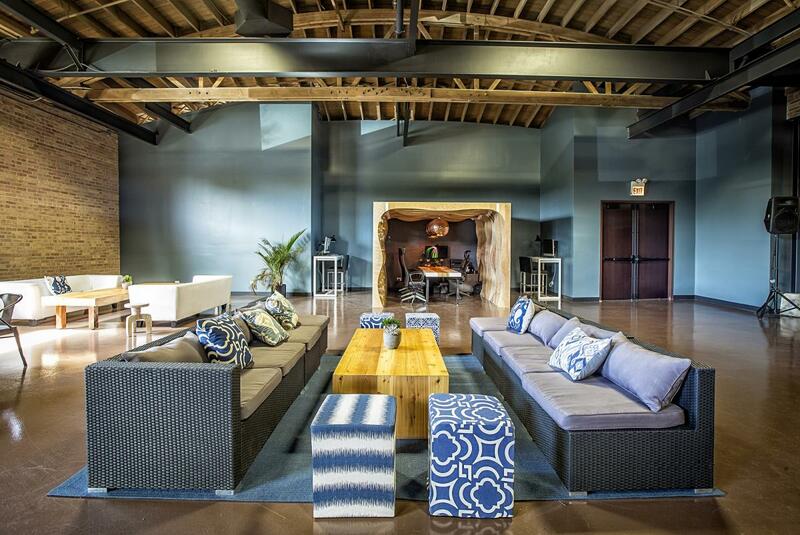 The industrial-chic Life Creative is a 70,000-square-foot co-working and corporate meeting/event venue perfect for makers to dig in and create, design and build. It offers the latest technology and equipment available, including design software and a CNC router that can carve designs. Decorated with fun props from previous Event Creative events, the space also features a conference room complete with pool and foosball tables, a media screening room and GIF booths, making it the perfect spot for team-building activities.